I have been working on this fox painting on and off for the last few weeks and finally got him finished. 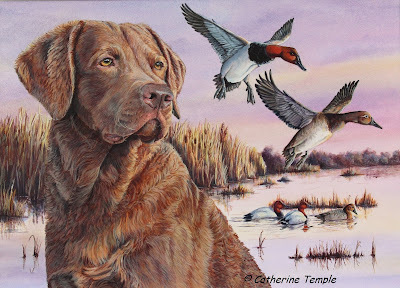 This painting was a commissioned piece for a past client. She provided me with lots of photos of this fox that she has named Charlie. Charlie is a wild fox that has become accustomed to humans. She met him one spring when she discovered the den on her cabin property. He was the bravest and most curious of the kits so she was able to get quite close and has been documenting his growth since that time. Charlie will come when you whistle for him and she leaves eggs out for him to find. Recently he has shown up with another fox that they believe is a female so perhaps they will raise a family there this spring. This painting features Charlie in a classic fox pose. Their coats in winter are lush and thick and that gorgeous tail makes an excellent foot warmer. 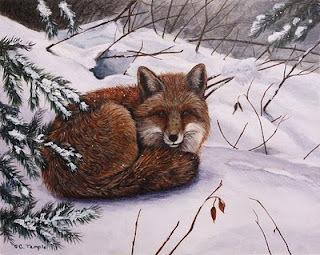 I loved painting the detail of that red fur flecked with little bits of fallen snow. This is just the first of many paintings I plan to do of this fox. My client has provided me with several photos of him from kit to adult and has given me permission to use them in future paintings. I have two ideas in mind already and will just need to keep that darned small stuff from getting in the way of my progress!!! !